The news of the earthquake shook me to the core. I thought of the children without parents, the parents who lost their children. The elderly, and the sick. How could I sit do nothing? I wanted to put legs on my faith, and do something for these people. When I got to work, I sent an email to about 15 guys asking if they wanted to try to get in and help. About half a dozen guys immediately expressed interest. Now, none of us knew anything about Haiti other than where it was on a map. But one of our guys managed to find a contact at a small missions fellowship in Barahona, Dominican Republic  1.5 hours from the Haitian border. By the time I called the number and talked to Lewis, our team was up to 12  as it happens, the exact number Lewis could accommodate. With our travel secured. We put out a call telling people we wanted to bring medical supplies to anyone in need, and donations could be dropped off at the church. By the end of the day, we had 15 bags of aspirin, Tylenol, antibiotics, gauze bandages, tape, Band-Aids, diapers, formula, children's clothing, etc., plus thousands of dollars that had been donated, packed and ready to go. We traveled from NJ, arriving at Barahona at nightfall. At the border, where UN convoys were gathering, we met a guy named Mike from West Palm Beach, FL., a real estate investor who does business in Haiti and the DR. He was on a solo mission to bring supplies into Haiti from the DR. He had rented trucks, purchased food and water canned foods, crackers, and other dried food for the Haitians and invited our team to join him on his trip to Love a Child Orphanage... When we got the orphanage the doctors and nurses were astonished  the ad-hoc supplies we had haphazardly gathered happened to be exactly what they needed to treat the children and other patients. Our team spent the rest of their time visiting with the patients, and praying with them. We got a call from our Pastor in New Jersey telling us that an orphanage in Jacmel was desperate for food and medical supplies. With roads wiped out by landslides, we drove 2.5 hours to Pedernales, a town on the western coast of the DR, where we hoped to pick up a boat the rest of the way to Haiti.... When we arrived at the pier, a local fisherman had what looked like 30' row boat that was making stops along the coast, finally ending up in Jacmel. It would be a 12 hour trip. We agreed on a price and went to the Military Marine office to register the voyage. When we explained to the Colonel what our intentions were  to take a dangerous trip in a small boat  he offered to take us, and any supplies we had, on a Naval ship the very next morning. Vice-Admiral Homero Luis Lajara told us they were running their ships from Cabo Rojo, DR to Jacmel, Haiti, every day  sometimes twice a day. I believe the Dominican Navy was making every effort possible to assist in the relief effort. I could see in his face the concern he had for the Haitian people. He spoke with passion for them and welcomed every effort being made to help.... When we landed in Jacmel our medical supplies were taken from the pier to the World Food Program [(WFP)] warehouse, run by the UN. We were a little uneasy about leaving our bags with the UN, but with no vehicle to carry us and our supplies, we had no choice. The UN officials promised us we would be able to come back with a truck and retrieve the bags the next morning.... Unfortunately, when we returned to the WFP compound the next day, they turned us away. We were staying at an orphanage called Hands and Feet, which happened to have a Food Distributor status in the country, and even they were unable to help us get our supplies. Who do you speak to in a situation like this? We spent the morning at the airport looking for someone to help us get our supplies, and met a local Christian missionary named Cody who had been in the country for 3 months, with plans to set up an orphanage. He and his wife, Maria, live outside the city of Jacmel and the night before had been able to load their little truck with tons of rice, pasta, smoked fish and tomato sauce in large cans sent to them from GO Ministries in the DR. We offered to help him, and drove over to his home. We walked into his house and saw every surface was covered with food, including some rather strong smelling fish. Maria and another Haitian woman were working feverishly to separate the food into care packages for the people in their village. I was really taken aback to discover that people like Cody and Maria were the only ones actually putting resources into the hands of the Haitians. Not the Haitian government, the US, Canada, Columbia, or French (all of whom I saw in the country) and especially not the UN. After helping them pack and distribute their food we tried the airport again where we finally met a woman associated with the WFP. We explained to her what happened, and that we had promised our church that we would deliver the resources they donated into the hands of the people (or medical professionals). The supplies were for the people, not for the government. We had already seen that everything that was coming into the country was landing in their warehouses, and nothing we being distributed to the people. The Haitians are there at the docks when the ships come in, and they can see all the large military cargo planes would fly in and drop off huge trailer sized boxes of supplies that come into the country and right into the WFP storage warehouses. In the 4 days I was in Jacmel, I saw supplies going into the WFP, and not once did I see anything come out, and I was right there outside the WFP facility. The woman agreed to help us, and after much negotiating, we made it through the WFP gate, pass the guards, and into warehouse where we pulled out our supplies. We loaded our small pickup truck, and I jumped in the back to sit on top of all our bags, hoping to be able to prevent any of the people outside the gate from pulling the bags out of the truck as we left the compound. If I ever felt threatened during this entire trip, it was at this moment. I understood the anger of the people, and wouldn't blame them if they tried to sabotage our truck. But we were determined to get it out of the warehouse and into the right hands. Thankfully, a UN vehicle pulled up behind us as we exited the facility, and the guards made sure we both passed the crowds unscathed. We spent a good portion of the day sorting our supplies, and divvying up portions for the local hospital, two orphanages, a big supply of over-the-counter medicine for Cody and Maria to hand out in their community, and most of all the surgical supplies for the clinic that was overrun with patients... That evening, we met Dr. Brinson McGowan, a surgeon at Emmanuel Medical Center, in Jacmel. He, along with two other orthopedic surgeons who just arrived in the country were having dinner at the Hands & Feet orphanage. After learning about the needs at the medical center, we decided to turn everything we had left over to these men before returning to the US ourselves. In a place that seems much like hell on earth, there are glimmers of hope. Like many of the volunteers who have come to Haiti from around the world, we were just a small group of 12 who wanted to serve the Haitian people  if you've done it unto the least of these, you've done it unto me. Postscript: After a week in Haiti, Lonnie and his team were relieved by other Calvary Chapel church members, including paramedics, doctors, and disaster relief experts from southern California. Next week, a team from Ft. Lauderdale will be going in to build a base camp in Jacmel, to distribute more food, water, clothing and medicine. The next step, with the rainy season only 60 days away, is to start building shelters for families that have left Port-au-Prince, or whose homes were destroyed. Calvary Chapel, which has nearly 2,000 churches around the world, plans to continue to work in Haiti for years to come. Read more in the new TIME book Earthquake Haiti: Tragedy and Hope and support TIME's Haiti relief efforts. See TIME's complete coverage of the Haiti earthquake. 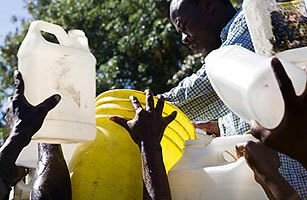 See how to help in Haiti. Video: Wyclef: The Next President of Haiti? Where Will the Next Five Big Earthquakes Be? Video: What is Slowing the Relief Effort in Haiti?